Herkimer Coffee Drip Blend from Bean Box. 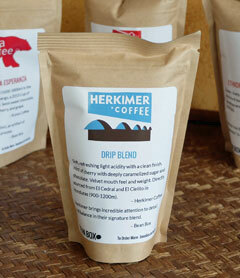 Our review of Herkimer’s Honduran Drip Blend, by way of Bean Box. First, a big thank-you to Matthew Berk of Bean Box for sending us four sample bags of coffee. This is what he and his business partner Ryan do with their company, Bean Box. They offer a subscription service for coffee lovers who don’t live in Seattle, but wish they had easy access to all the city’s wonderful artisanal coffee roasters. 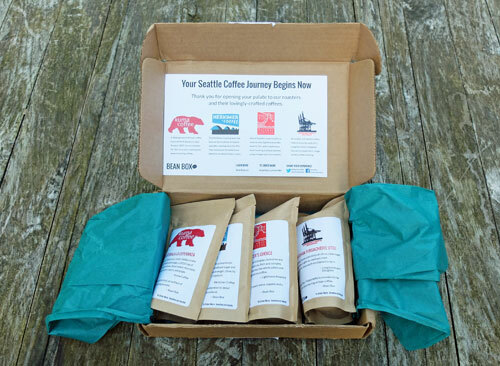 Each month they send their subscribers a box of four new coffees, each from a different roaster. 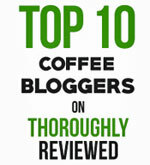 Think of it as an ongoing coffee tour of the city, without having to buy plane tickets. 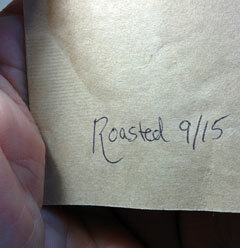 And before we get onto reviewing our first sample, let me say that I really appreciate how the roasting date is hand-written on the back of each bag. Believe me, this matters. When you buy a bag of beans in a supermarket, you are rarely told when it was roasted. For all you know, it could have been roasted a year ago, or longer. The first coffee we tried was the Honduran Drip Brew blend from Herkimer Coffee. This coffee comes from different growers in the El Cedral and El Cielito districts at an elevation of between 900 and 1200 meters. 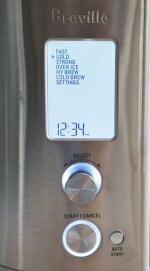 We brewed it in our Bonavita drip brewer, using a little under 10 grams of ground coffee for each 6 fluid ounces of water. And, of course, we ground the coffee just prior to brewing. Here’s the bag. It’s not big, with about 50 grams of coffee inside. Enough for a pot of coffee, and to decide whether you like it enough to buy a full bag. I’m going to work from the notes of my partner in coffee tasting here – my wife – as she absolutely nailed this coffee from the first moment. In fact, just from the aroma alone she identified the level of acidity, the sweetness, the caramel, the chocolate and the fruit. She has a better nose than I do! This is a medium roast coffee, plus a few extra minutes. In other words, a medium roast that is towards the dark side rather than the light side. The first taste confirmed what my wife’s nose had already concluded. 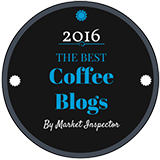 This coffee has a full and rounded acidity, which we both like. It’s what makes coffee coffee. Within that rounded, full-mouth feel is a sweetness that comes from a touch of both caramel and dark chocolate. To complement the sweetness, which is already balanced in part by the acidity, there is a touch of dark cherry. This is a very nice coffee. There is enough acidity there, but without any sharpness. The taste experience is smooth and soft from start to finish. Plus you get that sweetness. We both loved it. And that was a pleasant surprise because before now I hadn’t been a big fan of Honduran coffee. In fact, my wife likes it so much she want me to reorder so she can have it every day. In short, I would have to say this is a five-start review. And now we can look forward to trying the next bag in our Bean Box. Stay tuned. You can learn more about Bean Box here.